I didn’t sleep good last night because my tummy was hurting all night and the temperature just didn’t seem right. It probably didn’t help that I slept in three days in a row during the long weekend! Did you have the same problems getting up today from sleeping in all weekend? It seems like most blogs I was reading all weekend were mentioning that they were also sleeping in every day. I had raisin bran and coffee for breakfast. Boring, I know. 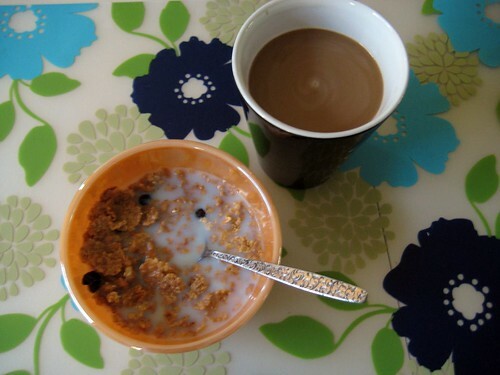 When I am tired, my breakfasts are simple and easy. At work, I had a Sprite with some tummy medicine mixed in, which tasted gross. I also noticed the Sprite made me a bit jittery, but I thought it would help my stomach feel better. 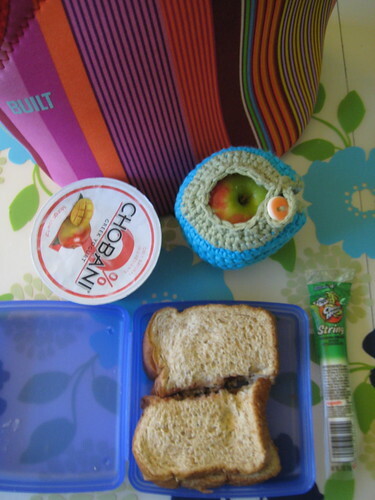 I ate lunch early on in the day and I could only get the peanut butter and jelly sandwich and string cheese in my belly. The apple and Chobani will have to wait for another day this week. I went to an important meeting mid-morning and then did yoga at work, which felt good but made me mindful of my pain. I left work after yoga because I just couldn’t handle feeling sick at work anymore. I am sorry if this post is whiny, but sometimes it is good for me to document how I am feeling. This whole thing is my fault for letting a medicine run out and not getting more of it. I went to Walgreens after work and picked up a huge bottle of what I needed, so I won’t run out for a while. Have you been reading Tina from Carrots ‘N’ Cake‘s posts on dealing with her recent diagnosis of colitis? Her posts are similar to mine at times when I have bad days like this one. I feel like it is nice to relate to another blogger who struggles with the same issues I do. I am glad she is getting the word out about Irritable Bowel Disease. Her diet is definitely different than the one my doctor recommended to me. I had never heard of going on a gluten free diet while colitis is active, but maybe I should try it sometime. When I got home, I found some nice things in my mailbox to cheer me up. 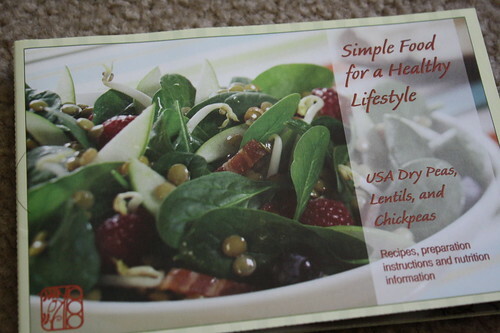 Something new to review and giveaway soon, some lentils, and a new Glamour magazine. 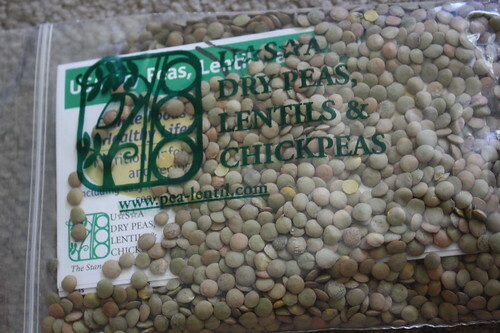 What is your favorite way to cook with lentils? I have never cooked with them before, but I am excited to try making something with them. My favorite veggie burger is the lentil burger from Cafe Manna in Brookfield. I wish I could recreate that! 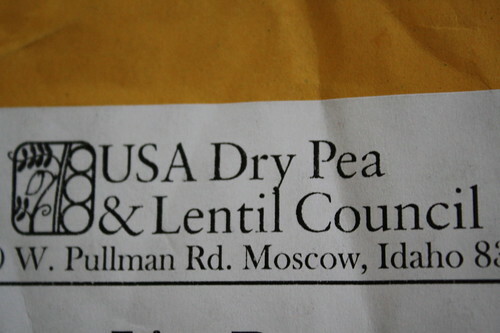 The nice folks at the USA Dry Peas, Lentils, and Chickpeas Council sent along some recipes with the lentils sample too. A few looked really good, including one for Lentils, Orecchiette, and Feta Cheese. I’m going to hit publish and go watch a movie. I need to relax a bit this afternoon. I also may hit up the gym because I think some movement will do me some good, like yoga may have earlier today.